The temperatures at a job site can make operating compact equipment power sources tough. In fact, simply getting a small engine to turn over can be a tall task when winter sets in throughout the country. Most compact equipment that contractors utilize on a job site is powered by air-cooled engines with less than 40 horsepower. Temperature extremes—hot or cold—can wreak havoc on the performance of air-cooled engines and the diesel units that are on our trailer jetters. 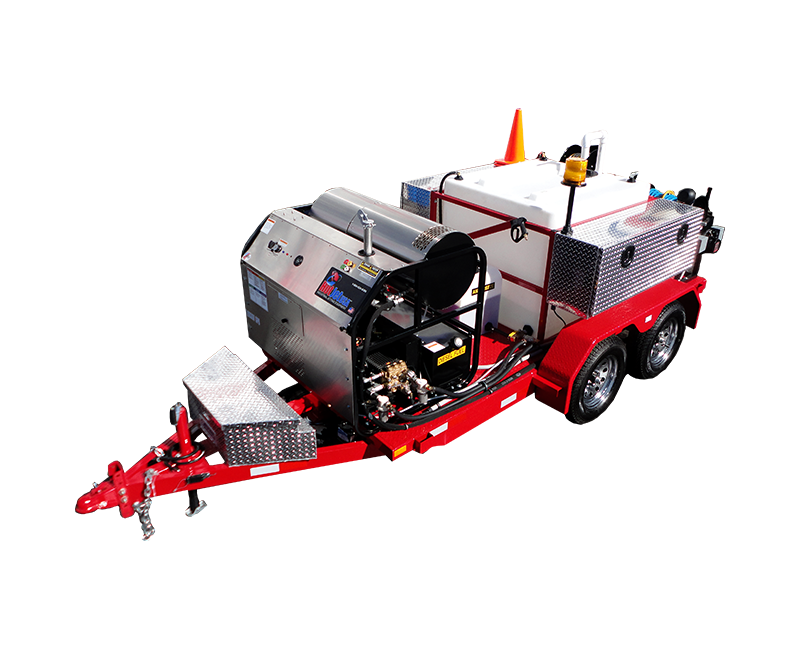 Fortunately for contractors and their crews, some preventive maintenance steps can be taken to improve the performance of small engines during the winter months and keep your trailer jetter ready for work even in cold weather. Fresh fuel is key to an engine performing at its full ability in extreme cold. Fuel volatility is adjusted by the fuel suppliers to the environment in which it is currently being used. Fuel must have a higher vapor pressure during winter months to evaporate more quickly in the colder temperatures. That improves starting performance of the engine. Always operate equipment using fuel within 30 days of purchase to boost engine performance in cold environments. Also, a fuel stabilizer can improve starting performance, according to Matt Anderson. Fuel stabilizers help lengthen the amount of time your fuel stays fresh and also improves repeated engine starts. The type of oil used in a small engine on a trailer jetter during winter can have a dramatic impact on the engine’s starting performance. A 5W-30 synthetic oil should be used for engines operating in an environment 40 degrees or colder. The synthetic oil allows the engine to turn over easier compared to heavier-weight oil. Heavy-weight oil can be like molasses in the cold, which makes starting really tough. The physical properties of a synthetic oil are optimized to perform in cold weather. To visualize the difference between 5W-30 synthetic oil compared to a heavier-weight oil in cold temperatures, it is recommended equipment operators pour a little of each type of oil into separate cups and place them in the freezer. The 30 weight oil turns to jelly or solidifies and the synthetic can still be poured. You won’t be able to turn the engine over fast enough with the 30 weight. Equipment also runs the risk of lack of lubrication failure. That’s a bad thing, especially when your trailer jetter can be working year round. Cold temperatures have an extreme effect on battery power, which directly impacts electric starting performance. Batteries need to be charged more frequently in cold environments as a battery’s capacity drops substantially as the temperature decreases. Therefore, it’s even more important in cold temperatures to make sure the engine’s battery is charged properly. Not only does a battery have a lower capacity in frigid temperatures, but it is more apt to drain down in cold temperatures, too. Batteries used for small engines on trailer jetters are just like car batteries. Equipment that sits idle for a period of time in cold temperatures is more likely to drain down. Battery corrosion can impact performance, too. Make sure the terminals on the battery are clean and tight. Over time you can build up corrosion on terminals and you’ll see starting performance decrease. That problem is exponential in extreme cold. If it is not an option to store the trailer jetter of small equipment in a warm location during idle time, the next best option is to cover the equipment with a tarp or something similar to minimize the effects of snow, rain, and wind. Vanguard engines are designed to thrive in extreme conditions, It is the reason why we here at Hot Jet USA use the Vanguard engines on most all of our hot or cold water trailer jetters. These preventive measures should be taken to assist the engine. Also, after the equipment is finished being used—especially in snowy conditions—make sure to wipe the equipment down and get snow or water off the engine immediately to prevent any ice from forming. Finally, don’t forget to check the air cleaner for any snow or water, which could freeze prior to the equipment’s next use. If you have any questions or concerns please do not hesitate to contact Chester Axley at Hot Jet USA -800-624-8186 or email me at chester@www.hotjetusa.com.